Helambu trekking lies just to the east of Kathmandu at maximum elevation of 3510 meters. Helambu region is inhabited by the Sherpa people. However, the Sherpas of Helambu observe different culture and lifestyle than the Sherpas of Khumbu region. Helambu trek is a well-known trek for people who don't have much time in Nepal. The Helambu circuit trek is an easy week long trek. It is a 7 days long treks which start in Kathmandu itself, but can be completed in as little as 5–6 days too. 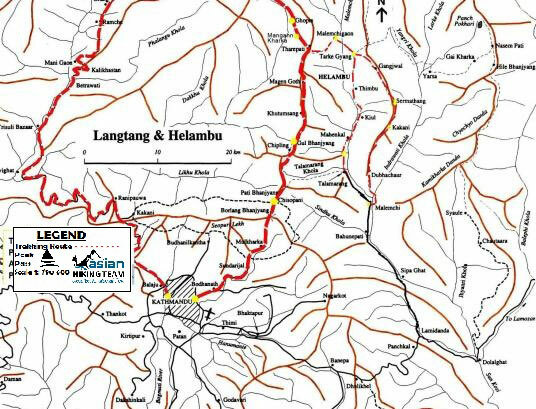 The normal trail head starts off at Sundarijal and goes past Chisopani, Kutumsang, Tharepati, Malemchigaun, Nakote and Hyolmo, Tarke Gyang. There are options, one is the footpath via Sermathang or the bus route via Talamarang. The beautiful terraced landscapes and the rustic villages allure many tourists in the region. The trekkers crossing the Lauribina Pass (4681m) return to Kathmandu via the Gosaikunda too. As we all know a powerful earthquake 7.8 magnitude shook Nepal on the 25th of April 2015 causing many human casualties and destroying Langtang and Helambu areas. So that we heartily request to visit on those areas because of your use porters or guide and buy the food and meals that local victim people take a benefit. Day 01: Arrival in Kathmandu, transfer to Hotel trip briefing, overnight Hotel (BB). Day 02: Drive to Sundarijal and trek to Chisapani (2175m) 4/5 hours, overnight hotel (BL/D). Day 03: Trek from Chisopani to Kutumsang (2446m) 6/7 hours, overnight lodge (B/L/D). Day 04: Trek from Kutumsang to Thari pati(3650m) 5/6 hours, overnight lodge (B/L/D). Day 05: Trek from Thari pati to Melamchi Gaon (2640m. ), 5/6 hours, overnight lodge (B/L/D). Day 06: Trek from Melamchi Gaon to Tarkeghyang (2743m), 4/5 hours, overnight lodge (B/L/D). Day 07: Trek from Tarkeghyang to Shermathang (2621m), 4 hours, overnight lodge (B/L/D). Day 08: Trek from Shermathang to Melamchi Pul Bazaar (846m), 4/5 hours, overnight lodge (B/L/D). Day 09: Drive to Kathmandu, overnight hotel (B/L/D). Day 10: Departure from Kathmandu or next trip (B). Shivapuri Nagarjun National Park permits; Fees. Day 01: Arrival in Kathmandu (1335m) transfer to hotel, trip briefing, overnight hotel (BB). Upon your arrival at the Tribhuvan international airport our representative welcomes you and assists to transfer in your hotel half hour in Kathmandu, trip briefing, overnight hotel. Day 02: Drive to Sundarijal and trek to Chisapani (2175m) 4/5 hours, overnight hotel (B/L/D). After breakfast in your hotel drive to Sundarijal (1350m.) by private vehicle starting your trek on foot to Chisopani (2175m.) which takes about five hours. The unpaved road from Kathmandu turns into a trail near a small hydroelectric plant. The trail will enter through the Shivpuri Watershed and Wildlife Reserve. The first settlement we will come across is Mulkharka with Tamang habitants. The route heads down the ridge through a forest of oaks and rhododendron to Chisopani, Overnight in lodge. After breakfast trek to Kutumsang which takes about seven hours. The trail continues to drop from Chisopani on a good, sometimes level, trail that crosses meadow and fields. You will then descend through Pathi Bhanjyang till Gul Bhanjyang. The trail climbs the ridge from Gul Bhanjyang to another pass at 2620m. The meadow makes a good camping spot, its downhill to Kutumsang at 2470m, in a saddle atop the ridge, Overnight at tea house/lodge. After breakfast trek to Thara pati which takes about five hours. The trek continues north up the Yurin Danda ridge and affords views of the peaks. The trail climbs above Kutumsang on a steep, eroded trail mostly through fir and rhododendron forest where there are no permanent settlements. Now you will be in Thara pati. There are few lodges and Goths (Domestic Animal Shed), Overnight Tea house. After breakfast trek to Tarkeghyang and it takes about six hours. The early part of the trek descends until you cross the stream named as Melamchi. Now you trek gently up to Tarkeghyang passing through Sherpa settlements. Tarkeghyang is a beautiful Sherpa village with one of the oldest and biggest monasteries. Tarkeghyang, also known as Helambu is named after the Helmu caste. The Sherpa people living here originally belong to Helmu caste, Overnight Lodge. After breakfast trek to Shermathang which takes about four hours. This day the trail is quite easier through flat land with beautiful forests on the way. You trek on crossing some small streams on the way. There is situated a beautiful village on the half way to Shermathang. To add your joy, Shermathang is another pretty Sherpa village where you can visit many ancient monasteries. From here you can see Jugal Himal range at the north face of Shermathang village. After breakfast trek to Melamchi Pul Bazaar and it takes approximately five hours. The trail gradually descends all the way to Melamchi Pul Bazaar through meadows and cultivated fields. On the way, you come across several old villages with their own particular tradition. Walking this day is quite pleasant with mountain views and interaction with local, Overnight Lodge. Today is free or last minute shopping for souvenirs or gift to your family, friends or relatives until your departure flight/drive or to commence any extra trips or activities you may have booked with us. If departing, you'll be transferred to the International Airport for your departure flight schedule to your on wards destination. Camera & accessories,Penciled, note books, reading books, Passport, Cash, credit card etc.